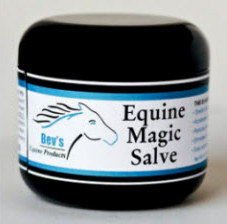 Bev's Equine Magic Salve (12 ounce jar)works like magic to heal simple or severe cuts, bites, scrapes, scratches, abrasions, rashes, rain rot or cracked heels. It also works to shield these areas fast from external predators such as flies, insects and bacteria. Equine Magic Salve heals wounds immediately and accelerates scab formation so the body can immediately start the healing process. Bev’s Equine Magic Salve for horses, canine and livestock also accelerates healing time and reduces pain and inflammation quickly, sometimes within minutes. Equine Magic Salve can also stops bleeding fast. Testimonials show that this product also works on cracked heals. There is no end in sight on what issues this product cannot resolve. Apply a generous amount of salve to the wound spreading it over the entire affected area and let the salve do its magic. No need to rub the salve into the wound. Once the wound is covered, you are done. Try to apply about 1/8 inch thickness of the salve on the wound to really give it a good coat of the product. Many wounds will only need one application. Bev’s Equine Magic Salves protects wounds from bugs, insects, bacteria and anything else that tries to attack them. Usually within hours you will see a nice thick hard scab on the wound. DO NOT REMOVE THE SCAB! From there, let the animal’s body do the rest. Once the wound is healed, the scab will fall off. And this will happen faster then you think as our salve accelerates healing time. This Salve becomes part of the scab and continues to help the body work its own magic in the healing process. However, if you have a really large wound, you may need to apply additional applications of Bev’s Equine Magic Salve until weeping subsides and scab appears. This is a natural product which contains Tea Tree Oil, Sulphur, Glycerin, Methylparaben and Potassium Sorbate. Please be sure to keep the lid closed tightly when not in use. Keep in a cool dry place.